Reputedly, Abbey Street "fell from grace" early in the 20th century. There are many lurid tales of how for middle-class children, in particular, it became a "no-go" area, off which you were warned by anxious parents. Yet its poor reputation was undeserved, as Peter Stevens made clear in his Childhood Memories of Abbey Street in the 1930s and 1940s (Faversham Paper No 44, obtainable from the Faversham Society). A highway laid out in the 12th century as a grand approach to the Abbey, it had survived Henry VIII's dissolution of the monasteries to become a residential area popular with anyone who owed their livelihood to the Creek, whether as merchant, craftsman or seaman. Towards the end of the 19th century, its middle-class residents started moving to new houses elsewhere in the town, and many of its properties became tenanted. The new occupiers were poorer, often much poorer, than their predecessors, but they were no less honest. They just found it much harder to make ends meet. Landlords neglected the properties, and so the street came to look down-at-heel. Determination to build a "brave new world" after the end of the Second World War encouraged local councils to sweep away houses that lacked "modern amenities". Most of those in Abbey Street qualified, but they were also historic buildings of importance. After intervention by the Society for the Protection of Ancient Buildings, an ingenious pioneering scheme launched by Faversham Borough Council in the late 1950s saved them from the fate that overtook many of their counterparts elsewhere. Apart from Arden's House (No 80), none of the properties is of outstanding national importance, and so they were not eligible for historic building repair grants. However, collectively they are of national importance, and so the first "town scheme" was introduced to make them eligible. Most of them were bought by the council under slum-clearance powers, and their occupants re-housed elsewhere. However, instead of being demolished the properties were sold to sympathetic owners who covenanted with the council to restore them under the supervision of an architect with experience of historic building care. To cover its costs, the council made a slight profit on each - buying the smaller houses for about £250 each and then selling them for about £300. Fifty years later, most are now in the £250,000 / £350,000 price bracket. 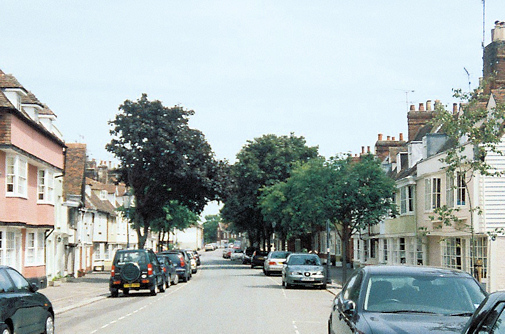 In other historic towns, streets were being brutally widened, but in Abbey Street the carriageway was actually narrowed - the first in the UK - to reduce traffic nuisance. At the same time, the street was planted with trees. 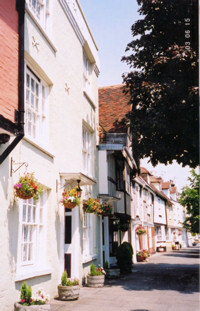 Abbey Street is sometimes said to be the finest medieval street in southeast England. Maybe, maybe not. It is certainly a wonderful "gallery" of old buildings, mainly timber-framed. As already noted, the ace in the pack is Arden's House, one of the few surviving buildings of Faversham Abbey, and possibly its guesthouse. 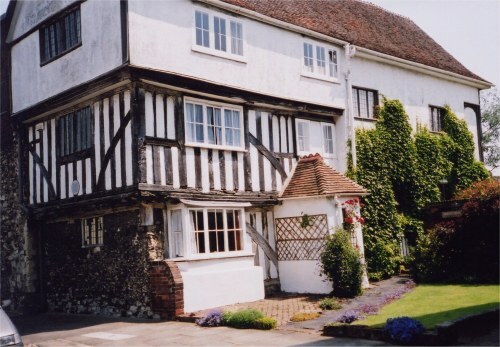 With 81 (Arden's Cottage), it originally formed a big "open courtyard" house. It dates from around 1450-1500, with remains of the Abbey outer gatehouse of c 1200, which spanned the street here. Here in February 1551 was murdered Thomas Arden, a native of Norwich who like many others made a fortune out of the dissolution of the monasteries. The crime was instigated by his wife, Alice, granddaughter of the shipwright who built the Mary Rose. In his single-minded pursuit of wealth, Arden had neglected her and she had a boyfriend with whom she planned the crime. It inspired the play Arden of Faversham, anonymous but still in the repertory. Shakespeare and/or Marlowe may have had a hand in it. Perhaps more likely Marlowe, as his father lived and worked in Faversham, or nearby, before he moved to Canterbury. Every few years the play is performed in the garden of Arden's House - perhaps the only place in the UK where an Elizabethan play can be performed in its real-life setting. 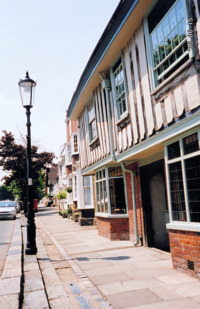 Several properties in Abbey Street are usually open during the Faversham Society's annual Open House event, held on the first three Saturdays in July.